This Fourth Sunday of Easter is popularly called “Good Shepherd Sunday,” and each year of the three-year lectionary cycle we read a portion of John chapter 10, which uses that beloved image. This reading occurs following the healing of the lame man at the Beautiful Gate by Peter and John (3:1-11) and Peter’s subsequent sermon (3:12-26). They have been imprisoned overnight (4:1-4) and are now questioned by the religious authorities. The question put to them about authority is not so much about the healing as it is about their proclamation of Jesus’ resurrection. Peter, as he so often does in the early chapters of Acts, speaks and uses a well-known text: Psalm 118:22. To say that “there is salvation in no one else” is to say that the reality of Jesus’ resurrection has released fresh energy to restore human life and, indeed, the world. In this passage the writer picks up themes we know well from John’s Gospel: life laid down, love for one another, knowing that we are from the truth, and Jesus’ abiding in us. Perhaps a development of John’s Gospel is the notion of love abiding in us “not in word or speech, but in truth and action.” It is certainly consistent with John’s Gospel, however, that the truth is not primarily something you know, but something you do. This Fourth Sunday of Easter is popularly called “Good Shepherd Sunday,” and each year of the three-year lectionary cycle we read a portion of John chapter 10, which uses that beloved image. This middle portion of the chapter is the most well-known. Jesus makes it clear: “I am the Good Shepherd.” The judgment on “hired hands” echoes Ezekiel 34, a passage critical of “false shepherds” in Israel. 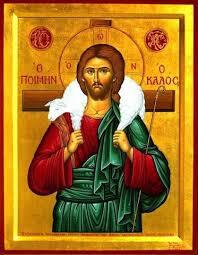 The true shepherd is the one who gives his life. He is also the one with whom we have true intimacy. We are known and so we know, a simple sentiment but profound in its implications. Then there are the “other sheep.” Who are they? No one really knows, although there are many theories. It certainly allows us to leave open the door that Peter in the reading from Acts seems to close. The Scripture quotations (except for the psalm) are from the New Revised Standard Version Bible, copyright © 1989 by the Division of Christian Education of the National Council of Churches of Christ in the U.S.A., and are used by permission. All rights reserved. The Collect of the Day and the Psalm translation are from The Book of Common Prayer. Commentaries are copyright © 2017, Epiphany ESources, 67 E. Main St., Hornell, NY 14843, www.epiphanyesources.com. All rights reserved. Permission to copy and edit for church services or congregational studyis given, provided this attribution remains.